The challenges to the contemporary legal platform, which include flattening legal spend and ever more robust in-house legal departments, are a consistent concern among today’s legal professionals. So too is the impact of evolving technology, often cited in relation to the rise of alternative legal delivery platforms, project management and, increasingly, cyber security. Less noted, however, is the capacity of today’s technology capabilities to enhance the competitive abilities of regional and super-regional firms (that is, firms with a majority of their human and other assets in secondary markets) to vie for the work that has sustained the viability of the national middle market law firms for the past 40-plus years. Law today is very much dependent on information technology. Long before the infusion of technology into the modern legal platform, law was, by its very nature, an information business. It can be argued that law was the earliest profession in modern Western society to systematically organize and code reams of data. However, the collection, interpretation, and application of information (the profession’s “secret sauce”) was protected from being easily (and competitively) accessed by the non-legal community through a variety of barriers. Examples of such barriers included compulsory state bar exams, degree requirements, mystical language (“legalese”), and the genuinely laborious, and intellectually difficult effort required to counsel both entities and individuals. These barriers were certainly made all that much stronger by a relatively uneducated general population1. The asymmetry of information access not only characterized the gulf between the legal sector and the general population, but also was a determinative factor differentiating levels of legal skills and expertise among law firms. This strongly influenced differences in reputation and rate structure among law firms both within and outside their region of origin. In time, however, these carefully defended informational barriers would become ever more porous as a result of the information technology explosion in the later part of the 20th century. At the beginning of the 20th century, not long after the closing of the frontier, yet long before the introduction of modern information technology, the American economy could be characterized as largely an amalgamation of vibrant regional economies rather than an integrated national platform. Because of this reality, few law firms, with certain exceptions (which were disproportionately situated in New York), had invested heavily in creating a national presence or reach prior to the end of World War II. The war and its aftermath, however, caused an accelerated maturation of the American economy. As a result, the most significant clients of these regional firms were increasingly participating in a truly integrated national economy, and doing ever more complex business across the American continent. Lawyers respond by expanding the size of their partner rosters, extending their geographic reach, and expanding their skill set. In time, this transformation was accompanied by the creation of new outposts, especially in such venues to which their dominant clients and attractive prospective clients were increasingly connected. All of these efforts were vital to the ongoing success, and even the very survival, of these firms. Without the large-scale investments in technology, the creation of these expansive and complex platforms might have been difficult, or perhaps impossible. Technology eased the challenges of accountability for work product, productivity, and efficiency, as well as such fundamental requirements as conflict checks, which, on a large and expansive platform with thousands of clients, can be a bedeviling chore at best. The technology revolution that helped more aggressive firms expand beyond historic geographies has paralleled the increasing commoditization, or fungibility, of legal services, especially over the past two decades. This parallelism is a reflection of a dynamic cause and effect, for at the heart of commoditization of legal services are the two highly interrelated factors of information technology: speed and accessibility. Never has it been easier or faster for lawyers to access legal information. In many transactional practices, the shelf life of innovative products and arrangements, which has a strong relationship with pricing, is getting increasingly shorter. An acquaintance of mine who is a partner at a high end, high rate New York firm has mentioned to me on several occasions, over the nearly 20 years we have known each other, that the complex securitization products he documents once supported his billing rate for a solid two years, at which point enough other firms had acquired the skills and document forms to allow the clients to demand increasingly steep discounts. He also noted that over time, the shelf life for similarly complex documentation would only sustain a one year shelf life, and that now the time between creation and wide dissemination has been halved again. The advancement of information technology can be a disruptive factor to the business model of established national firms, especially those positioned in the middle market. Conversely, it can be a boon to the regional and (especially) super-regional law firms. Super-regional law firms, as a class, constitute one of the most dangerous, if not yet fully appreciated, competitors to national middle market firms. 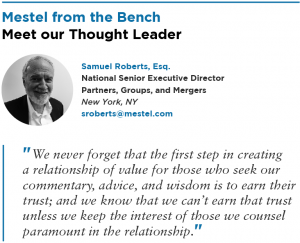 With their ever-increasing ability to level the playing field with respect to product quality, the super-regional law firms are advantageously positioned to fully exploit their lower cost structure. Not only can they offer lower rates than most of the national middle market firms as a consequence of their real estate and labor cost advantages but also because they can satisfy the compensation demands of many of their most talented partners (or the laterals they seek) by paying significantly less than their big city rivals must pay to their key rainmakers. It hardly needs to be pointed out that a partner compensation package of one million dollars annually in Cincinnati, Kansas City, or Winston-Salem provides at least as much buying power as a package twice that in New York, D.C., or San Francisco. 1 According to the U.S. Census Bureau, less than 10% of the U.S. population had Bachelor’s degrees or higher in 1940 versus 24% in 2000.